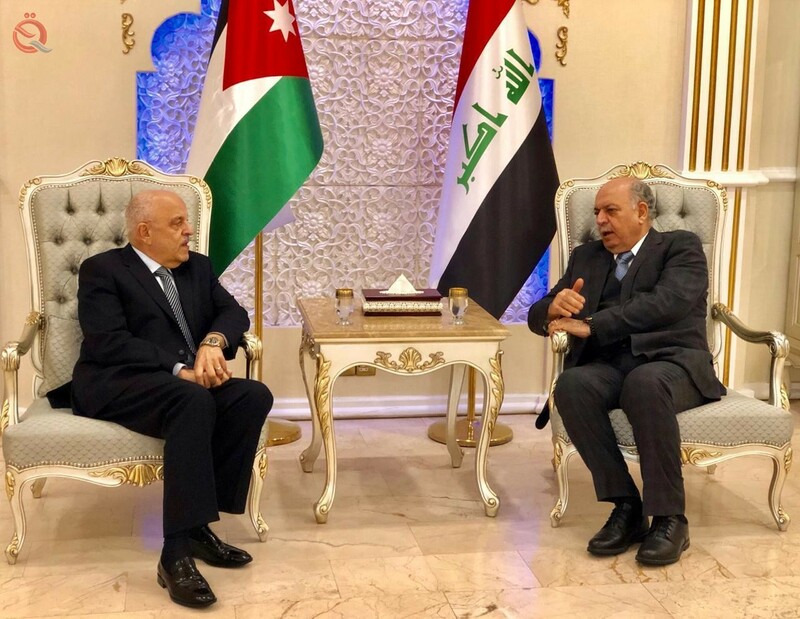 Jordanian Deputy Prime Minister Rajai Saleh al-Muasher arrived in Baghdad on Monday and was received at the airport by Deputy Prime Minister for Energy and Oil Minister Thamer Abbas al-Ghadhban. Muasher expressed his happiness to visit Iraq and meet with the brotherly officials to support and strengthen bilateral relations in all fields. For his part, Deputy Prime Minister for Energy and Minister of Oil Thamer Abbas Ghadhban stressed the importance of strengthening and developing bilateral relations with the brothers through the conclusion of a number of agreements and memorandums of understanding aimed at implementing a number of projects that contribute to the development of cooperation and economic integration in the field of oil and energy, In the interest of the two brotherly peoples in Iraq and Jordan, pointing out that he will hold talks with his counterpart to discuss issues of common concern. The schedule of the visit includes discussions with his angry counterpart as well as a number of officials in the state and the government. Baghdad Chamber of Commerce announced on Monday that Jordan has raised the entry of Iraqi traders, saying that this will strengthen bilateral relations and contribute to increase investment opportunities between the two countries. "The recovery of the Iraqi economy has a positive impact on the economies of the region and the world, because it is important at all levels, and this is what all the economies of the world have realized," the statement quoted the head of the Baghdad Chamber of Commerce Jafar al-Hamdani as saying during a meeting with a Jordanian economic delegation. 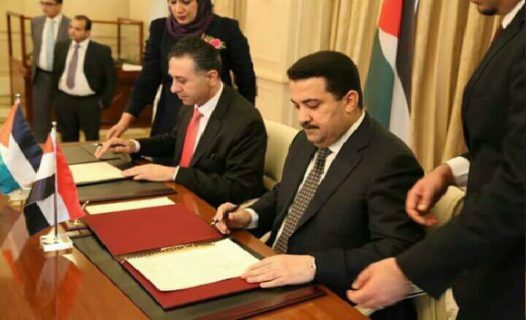 He added that "the ambition of the Baghdad Chamber of Commerce of the presence of the Jordanian delegation to be a real breakthrough to achieve the Arab Customs Union and the Arab free market and strategic partnership." Al-Hamdani pointed out that "the importance of discussing the files that enhance the reality of economic cooperation and move it to a new stage," stressing the need for "both sides to facilitate and freedom of transport of goods and funds between the two countries. BAGHDAD / Ibrahim Saleh / Anatolia - Deputy Prime Minister Rajai Moasher, said Monday that his country reached an agreement with Iraq, free trade between the two countries. This came during a joint press conference with Iraqi Finance Minister Fuad Hussein, who is also deputy prime minister for energy, in Baghdad. "We have signed a free trade agreement between the two countries, and have been activated and put forward comments on the competition of goods produced in both countries, to contribute to the movement of trade exchange better," said Muasher at the conference. The Jordanian official gave no further details on the terms of the FTA and when it officially began. But he said the prime ministers of the two countries would meet on February 2 to finalize agreements between the two countries in various fields. Muasher pointed out that the energy sector is one of the agreements to reach a final understanding, such as an oil pipeline from Iraq to Aqaba and the electric connection between the two countries. In April 2013, Jordan and Iraq signed a framework agreement for a 1,700 km oil pipeline project at a cost of $ 18 billion and a capacity of 1 million barrels per day. The proposed pipeline runs from the southern Iraqi province of Basra to Aqaba in southern Jordan on the Red Sea. The Kingdom hopes to meet its energy needs through the pipeline (150,000 barrels per day) and exports the rest through the port of Aqaba. Moasher said that the Jordanian cabinet approved the pipeline agreement, which the Iraqi government is currently studying, in preparation for a final agreement and start implementation of the project, adding that we are optimistic that implementation will be soon. For his part, Fouad Hussein said before the meeting there were bilateral meetings between the Iraqi and Jordanian ministers, and we reached an agreement for joint action in many areas. The Jordanian delegation headed by Moasher and members of the ministers of industry, trade, catering, health, finance, municipalities, transport and energy and the Governor of the Central Bank of Jordan arrived in Baghdad on Sunday for an official visit.